The new Justice League, 3 of whom aren't actually in this issue. So if you’re at all interested in comics, or sleeping with someone who is, you know all about the big DC relaunch that’s coming. DC Comics is essentially wiping the slate clean, and rebooting their entire universe. None of the stories that you loved growing up actually happened, and they are rebuilding their entire continuity from the ground up. It’s like Greedo shooting first, but on an epic, cosmic scale. This issue succeeds on neither front. Mediocre is a word that gets thrown around a lot, with usually a more negative connotation than it deserves. But sadly, it’s the perfect word for this sleepy, sleepy comic book. 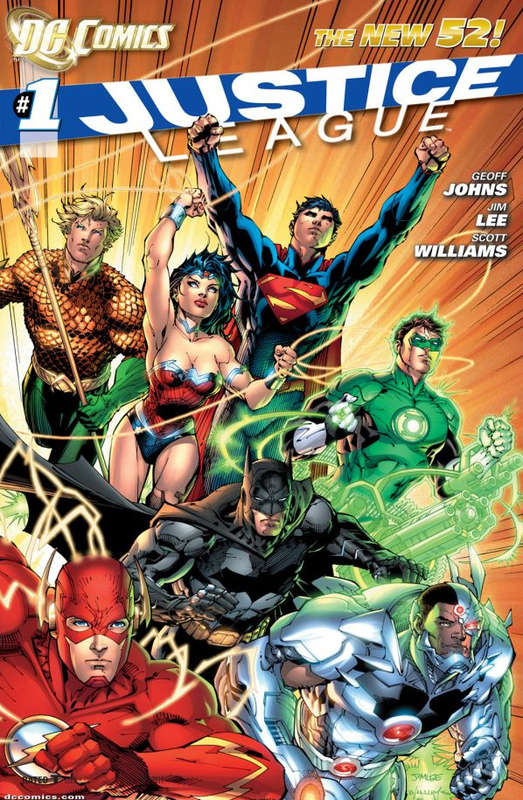 First of all, if you’re going to have a comic book about a team of heroes, I expect to see that team in the book. No? How about half the team? Just barely? Sigh. This issue focuses almost exclusively on Batman and Green Lantern, and one might suspect that writer Geoff Johns thought that his Green Lantern movie was going to be a hit when he wrote this, and thus decided to showcase the two heroes most recognizable to modern audiences. So basically Green Lantern and Batman team up to go after evil aliens, and find themselves on the run from the cops for most of the issue. This gives them plenty of time to snark at each other, and then at the end of the issue a guy shows up that I think is supposed to be Superman but couldn’t be because there is NO way that DC would ever allow such a bad costume design to actually get into one of their comic books. And that’s pretty much the issue. Two people team up to take down a bad guy, and then another person shows up at the end. Hardly a world building blockbuster. This book wasn’t “bad” in the traditional sense. Jim Lee is considered one of the great living superhero comic book artists for a reason, and he makes pretty much every page pop here. And Geoff Johns put together a decent ‘Heroes put aside their differences” story. But this book is essentially the pilot for the biggest comic launch the business has seen since 1986.. Words like “decent” and “average” shouldn’t be used for this book. Words like ‘Skullripping” and “EyeballExploding” should. Let me clarify: My negativity isn’t a backlash against the continuity changes they’re making here. I don’t care about any of that. I don’t care that it’s different, all I care about is that it’s good. And this ain’t. I will still give some of the new issues that launch next week a chance. When it comes to superhero comics these days, It’s creators I care about, not characters. And so since people like Peter Milligan, and Gail Simone, and Nathan Edmonson, and Jeff Lemire, and Matt Kindt, have new books, I will definitely give them a try. But if Justice League #1 is indicative of what’s in store for me, I’m not holding out much hope. This entry was posted in Comic Books and tagged Batman, DC, Gail Simone, Geoff Johns, Jeff Lemire, Jim Lee, Justice League, Matt Kindt, Nathan Edmonson, New 52. Bookmark the permalink. Great post. My sentiments exactly.